Famous for her rugged beautiful scenery, Northern England is home to some of the most iconic journeys in Britain; whether it is the haunting Hadrians Wall Path, voted as one of the top ten walks in the UK by ‘Lonely Planet’, the wonderful, inspiring Wainwrights Coast to Coast, the stunning lake and scenery of the Lake District, or the diverse and beautiful Dales Way, here at Walk the Trail we will be able to create the perfect walking holiday for you. 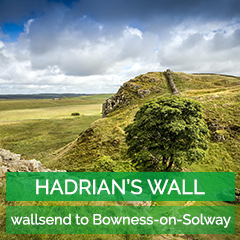 As Britain’s most iconic remaining Roman monument, Hadrian’s Wall Path covers 84 miles (135km) of some the most rugged and barren terrain. 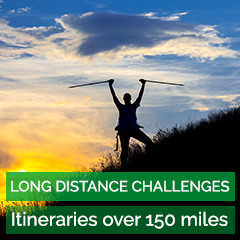 Any visitor stepping back in time along this epic journey cannot fail to imagine the Roman legionnaires toiling for almost ten years in this dramatic land, with the ever present threat of attack from the determined and marauding Celts. Your journey starts on the banks of the River Tyne at Wallsend before heading up to the rugged up-lands of Northumberland and Cumbria before ending at the village of Bowness-on-Solway. Although, you will have to use your imagination in some parts, large sections of the wall remain intact and painstaking work has been carried out to excavate forts, mile-castles, turrets and the very buildings used ‘day to day’ by the occupying Romans. 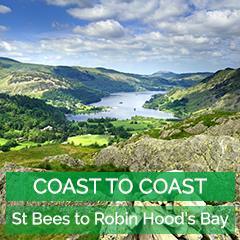 Crossing the North of England from one coast to the other , both having dramatic coastal vistas ,this 190 miles (300km) route passes through some the most varied and beautiful scenery Britain has to offer including ancient castles, medieval abbeys quaint English villages with tea shops and pubs. Taking in three national parks – the Lake District, Yorkshire Dales and North York Moors,the trail begins at St Bees on the shores of the Irish Sea before entering the rugged mountains and lakes of the Lake District over the rolling hills and shaded valleys of the Yorkshire Dales across the heather carpeted moorland of the North York Moors before journey end at Robin Hoods Bay on the shore of North Sea. Taking in parts of both the Yorkshire Dales and Lake District, the Dales Way, commences in the delightful market town of Ilkley and ends 81miles (130km) later at Bowness on the shores of Lake Windermere, England’s largest lake. The Yorkshire Dales have a rugged tranquillity, with serene, green valleys, charming villages and hamlets, often with no more than a pub and village shop and the Lake District has abundant fantastic mountain views and shimmering lakes, some 300 million years in the making. 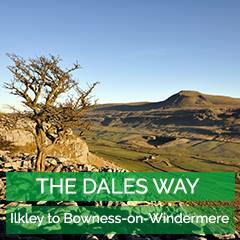 Considered a little gentler than some walks, the Dales Way is a perfect journey for all.